With 28 acres of secluded parkland and 800 feet of shoreline on beautiful East Lake, Lake Avenue RV Resort & Campground is the perfect family getaway for boating, swimming or just relaxing on our beach. Open seasonally, Lake Avenue features RV sites, cottage rentals and cabin rentals for short term visits. Kids love our large playground, heated swimming pool, wagon rides and the variety of summer activities. Anglers love the great walleye fishing on East Lake, which also has plenty of bass, pike and pan fish too. Whether it’s singing by the campfire or getting out on the water, Lake Avenue has something for everyone. 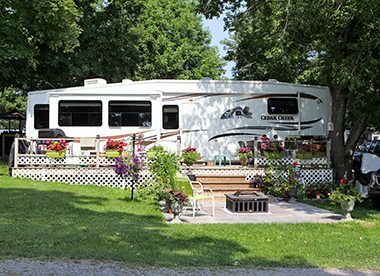 Lake Avenue RV Resort & Campground is your home away from home. We offer a variety of rentals with all the amenities you need for a comfortable, enjoyable stay. Make Lake Avenue your permanent vacation destination. We offer a variety of comfortable vacation homes for you to choose from. Are you just stopping by to take advantage of our park amenities? Call or visit our offices for your day pass. Looking for things to do and places to visit near Cherry Valley? Check out these great local attractions and more!